Queenstown location of Willowbrook Self Contained Cottage, Barn & Studio Accommodation in the beautiful Wakatipu Basin. 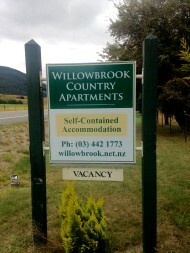 Willowbrook Country Apartments accommodation is located on the rural country 'back road' between Queenstown and Arrowtown (Malaghans Road). We are about 3km from Millbrook Resort in the Queenstown direction. Unless you are coming from Invercargill, you will be on Route 6 from Cromwell / Wanaka. Turn right towards Arrowtown when you get to Lake Hayes (Amisfield Winery is on corner). Go about 5km and just before Arrowtown, turn left into Malaghans Road. (The sign says "Queenstown via Coronet Peak".) 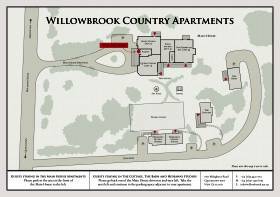 Millbrook Resort is on your left and Willowbrook Country Apartments are a few minutes further along that country road also on your left. If you are coming up from Te Anau or Invercargill on Route 6, you will arrive in Frankton shortly after crossing the Kawarau Falls (single lane) bridge. You will pass Queenstown Airport on the right and come to a roundabout. Queenstown is to the left and Wanaka / West Coast / Cromwell / Alexandra / Central Otago / Dunedin are to the right (Straight on is a BP Petrol Station). Turn right and follow the road for about 3½ km , crossing the Shotover River and up the hill. At the top of the hill, turn left into Lower Shotover Road and follow this road for about 6km until you come to a T-junction. Turn right into Malaghans Road and Willowbrook is just over 1km on your right. Willowbrook operates a NO SMOKING policy in all our various accommodations. Check in time: from 2.00pm. Click map image below for printable version.